. . .during these frigid Hoosierville winters. 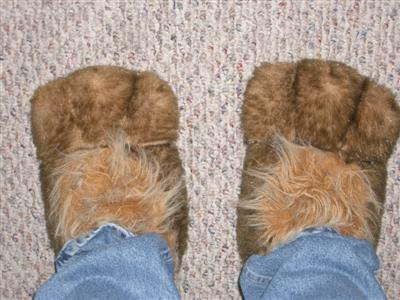 I had told my wife that now since I’m old and married I figured I needed some slippers. We looked in Wal-Mart and I found some I liked but there were none in my size. I was sore displeased. Then for Christmas she gave me a pair of the exact ones I wanted! Somehow she found a bigger size later. I’ve never been a huge fan of slipppers. But our downstairs bathroom has a tile floor and let me tell you, slippers feel mighty good in there on those cold winter mornings. Just wait until you’re old and married!